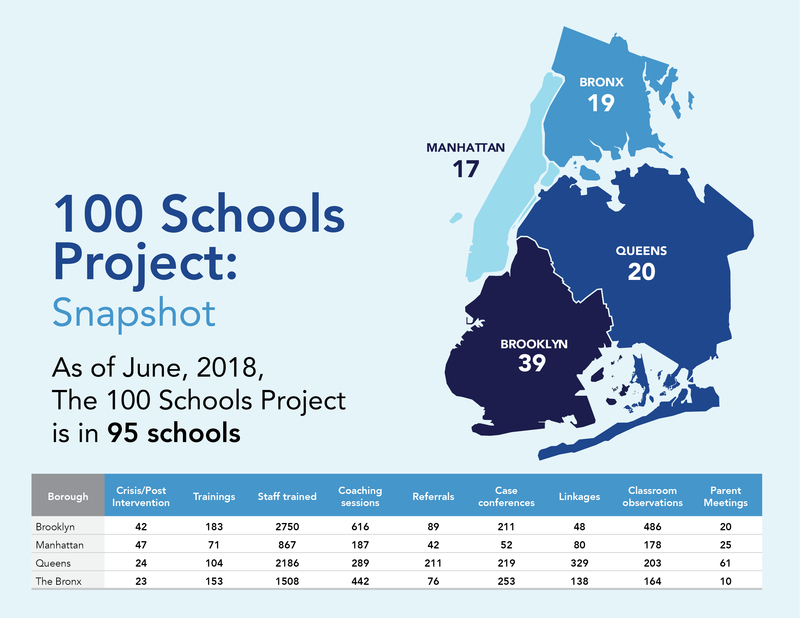 At the conclusion of the 2017-2018 school year, the 100 Schools Project has made a tremendous impact across New York City, fostering safe and productive learning environments, and reducing the stigma of mental health within the communities. Now in 95 schools across the Bronx, Queens, Brooklyn and Manhattan, an increase of 52 schools since September 2017, Behavioral Health Coaches are personalizing services to the needs of each school they work in to promote wellness and prevent distress in the classroom, meeting the needs of students with emotional, behavioral and substance-abuse issues that can often be a challenge for schools. This has been achieved through staff trainings and student workshops coordinated through the 100 Schools Project. In one school, for example, the Behavioral Health Coach was asked to prepare a LBGTQ training when a student disclosed her transgender identification. Staff had previously noted the student had withdrawn from peers, presented oppositional behavior and received interventions for suicidal ideations. The training was an opportunity to answer staff questions and implement new protocols, such as the school honoring the student’s request to refer to her using female pronouns and her chosen female name. The school’s response and accommodation were very helpful to the student, reported the Behavioral Health Coach, as the student’s peers were incredibly supportive and the teachers have noticed improved academic engagement. Schools have also developed interventions specifically for the students. In Manhattan, following an incident involving underage drinking in the school, the Behavioral Health Coach organized a workshop with the NY Counter Drug Task Force and hosted a speaker from a local residential adolescent drug/alcohol treatment center. The speaker detailed her story of drinking, which started for her at the same age as the middle schoolers. Students also participated in peer pressure navigation and refusal skills development training. Developing tailored trainings for school staff, as well as workshops for students and, in many cases, parents, is leading to a positive impact on schools’ climate and reducing the stigma of mental health. To scale the benefits of the program, over the summer the 100 Schools Project will expand to colleges. Four community colleges in the CUNY System – Bronx Community College, Guttman Community College, Hostos Community College and LaGuardia Community College – will begin to host workshops for staff, student leaders and families, conduct crisis trainings and mentor students interested in behavioral health careers. Launched in September 2016, OneCity Health and three other New York City-based Performing Provider Systems (PPS) —Community Care of Brooklyn, Bronx Health Access, and Bronx Partners for Healthy Communities—oversee the 100 Schools Project while the Jewish Board of Family and Children’s Services (The Jewish Board) coordinates the initiative and leads the trainings. Participating schools also learn how to connect students who have emotional, behavioral, or substance-use challenges with top-tier local mental health providers while enabling the students to remain in school. Please continue to read the OneCity Health newsletter for more on the expansion of the project into colleges later this summer.